The Ice Age series is weird for me. 2 out of the 4 films in the series I found to be much better on rewatch. 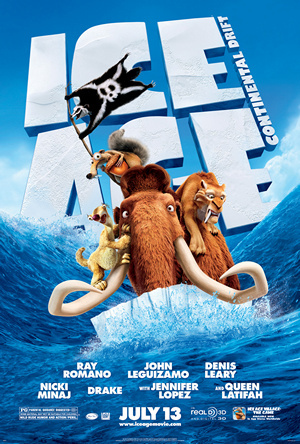 “Ice Age 2: The Meltdown” was just ok when I originally saw it, and it got funnier and funnier each subsequent time. “Ice Age: Dawn of the Dinosaurs”, which I thought was a loathsome way to end a fantastic series also gained laughs and a large amount of enjoyment- even improving Simon Pegg’s deeply ridiculous character who became an almost welcome addition to the cast the more I was exposed to his particular brand of crazy. So maybe in a few rewatches I’ll find the the latest (and last?) Ice Age film a worthy entrant into the series. As it stands now it has some good and some bad. Ok, a little more bad than I’d hoped. Manny, Denis Leary’s Diego, and John Leguizamo’s Sid). First we had Queen Latifah as Romano’s love interest (along with her brothers Josh Peck and Seann William Scott) , then Simon Pegg as a crazy weasel. These characters were embraced by fans (with the possible exception of Pegg, but we’ll get to that) and with the 4th film the went ALL OUT adding Wanda Sykes (Sid’s grandmother), Keke Palmer (Manny and Ellie’s daughter Peaches), Josh Gad (Peaches’ friend), Drake, Heather Morris, and Nikki Minaj (Peaches’…teenage peers? ), Peter Dinklage (Captain Gutt), Jennifer Lopez (Diego’s love interest), and Aziz Ansari and Nick Frost (pirates). That’s 10 new characters with ample screen time along with the “series regulars.” That’s a TON OF CAST! And, this movie doesn’t have enough plot to really support that kind of ensemble. In fact, for the bulk of the film the cast is separated by an ocean and never interacting except at the beginning and the end. It’s not that this is a bad movie it’s jut bloated. Given that there are these 2 separate stories, with 4 million characters, you’d be surprised to know that there is a third story for our favorite silent saber-toothed squirrel, Scrat. Scrat is a strange one in the Ice Age series as his story never intersects the main stories, but he can affect them, in this film he is the inciting incident of the breakup of Pangaea. This time around, he gets his own story weaved throughout the film, when the action wanes to keep the laughs up. All that being said, this is a kids film. They know their audience and they play to them a lot. From the awkward musical number, to the gross out humor, to the army of proto-hamsters, the younglings will find tons to get excited for. As for adults, enh. While there are moments-nodding to the ridiculousness of the third movie was a nice touch- there’s just so much going on, adults will probably spend half of their time explain the action to the kids.